You are silently flying over a massive digital composite of satellite imagery. More specifically, you are flying over Granada Hills, California in the San Fernando Valley where water was scarce and pools are now plenty. Granada Hills is the endpoint of the Los Angeles Aqueduct, built between 1908 and 1913, which diverts water from the Owens River into Los Angeles. While it made development in the water-scarce San Fernando Valley possible, it also devastated the ecosystem of the Owens Valley. Everything in the landscape has been darkened except for the swimming pools. 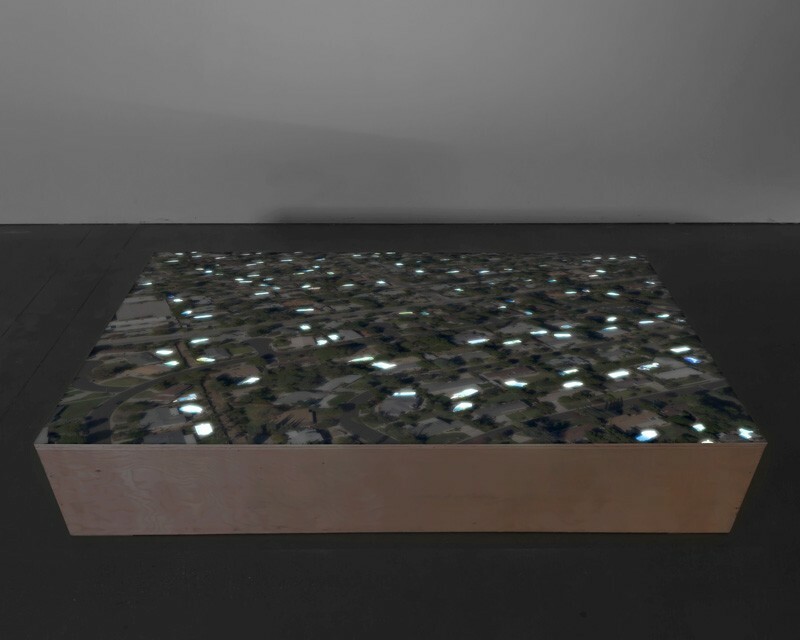 The video is projected down onto a wooden platform that viewers can stand above as the landscape pans by.